Student living designed to encourage interaction and social encounters. 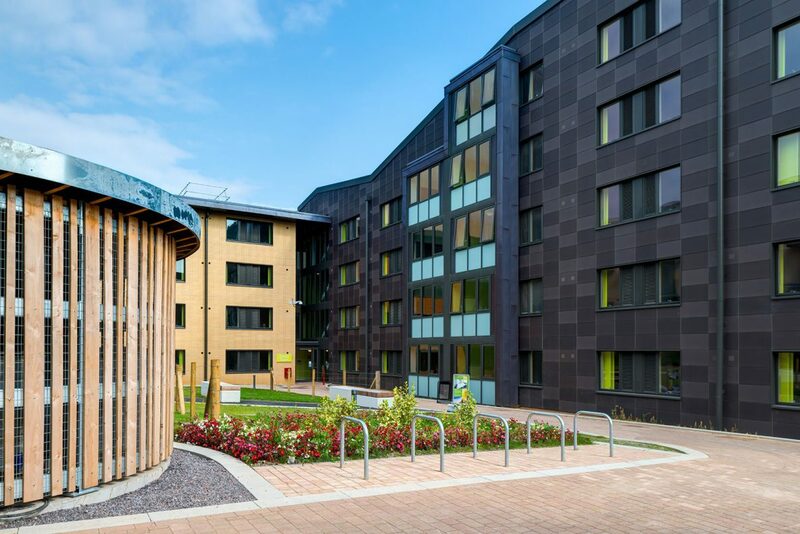 The Quads student accommodation is divided between two buildings, providing 708 ensuite bedrooms arranged as cluster flats and a 350 seat refectory called the Lime Tree. 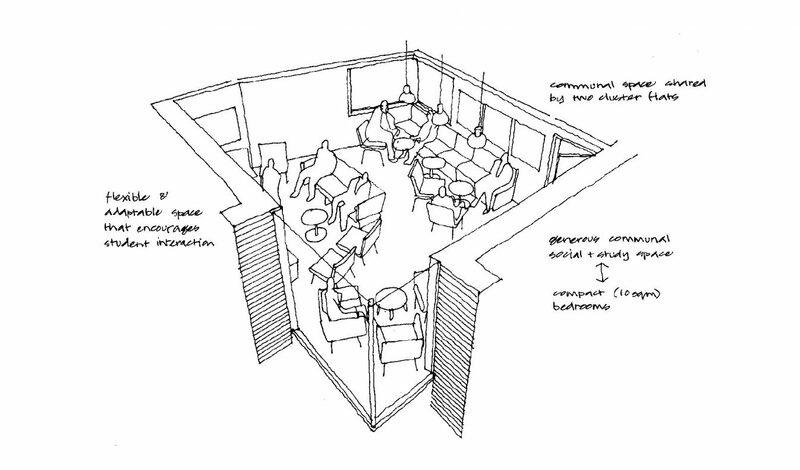 The premise of the design was to encourage students out of their bedrooms to interact with each other in large communal spaces that can be used for socialising, group working and general living. To maximise the space, it is suitable for summer schools and other event accommodation during non-term time. To successfully achieve this, we developed the size and layout of the bedrooms in consultation with students and staff at the university, resulting in the construction of a mock bedroom to test the design. 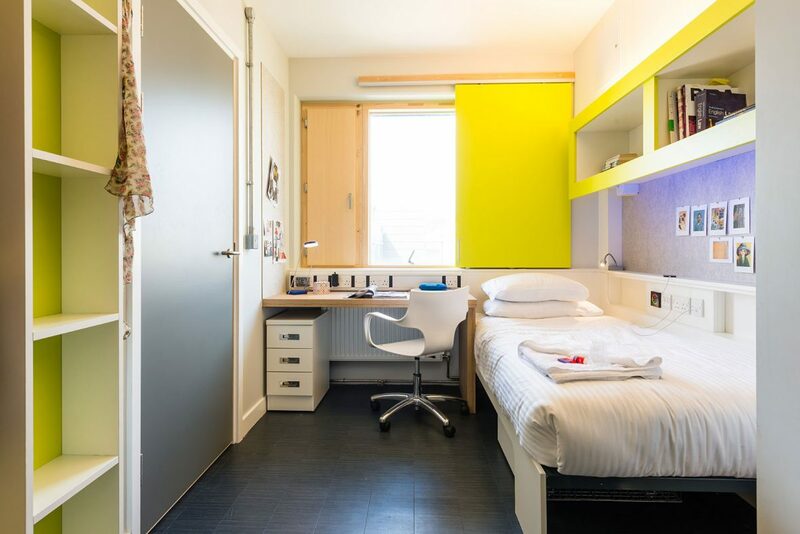 The end result was a new accommodation concept for the university, comprising a space efficient ensuite bedroom of 10.2m2, with ample storage, desk space and flexibility, all within a homely environment. This bedroom size allows for a large communal lounge, shared by two flats at every floor level, providing the desired flexible social space and putting less reliance on kitchens and dining areas as the focal point of contact between students. They are equipped with TVs, flexible soft seating and study space to enable students to use the space as they see fit. An innovative feature of the accommodation also includes an all-purpose key card that students use for access to their bedrooms, turning on/off lights, library access, ordering food and their ID. 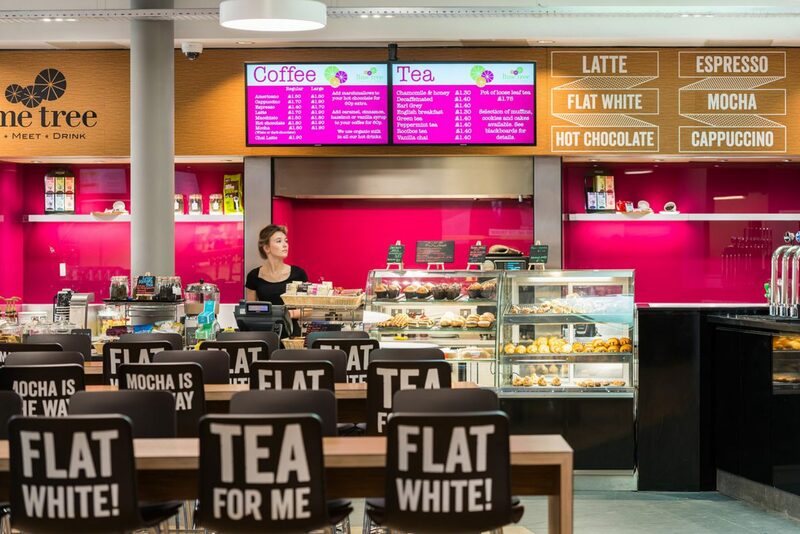 A flexible catering facility that can accommodate up to 350 people at any one time, the Lime Tree serves full time students, the Summer School and conferences throughout the year, and, as the student accommodation is self-catered, forms an important dining facility for the university as a whole. Its inclusion as part of the accommodation allows the emerging student village to the west to connect with the central parade that forms the hub of the campus. 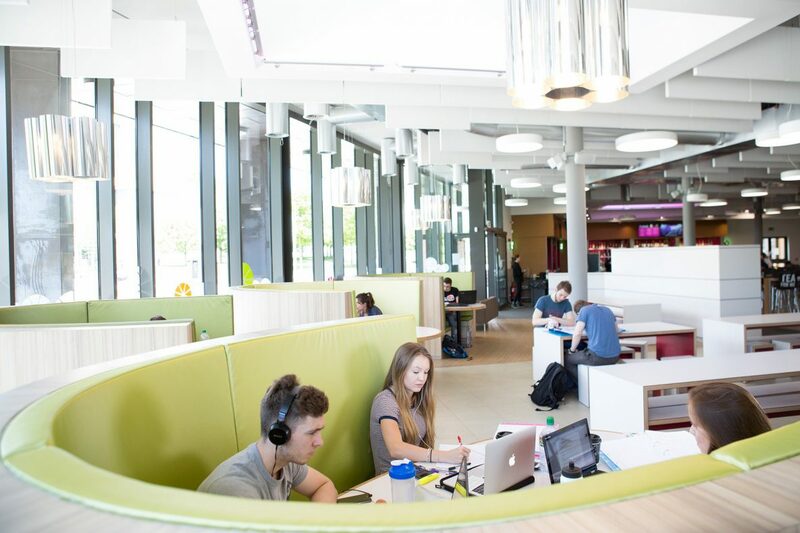 Situated on the ground floor of the accommodation, students can order pizzas to their bedrooms, or easily go down to access the main dining area, which also has a canteen for healthy food and a more traditional menu. Similar to the accommodation, this facility can be used year round for conferences and events, or larger social gatherings, with a bar that can be fully operational in the evening once other facilities are closed for the day. The Lime Tree and accommodation utilise the same pallet of external materials. A light brick, copper and glass facade encloses the Lime Tree space, whilst a large roof overhang provides shade and sheltered gathering spaces along the facade. Colourfully lit copper clad lanterns sit on top of the Lime Tree roof so as to provide additional light and colour to the refectory dining area below. 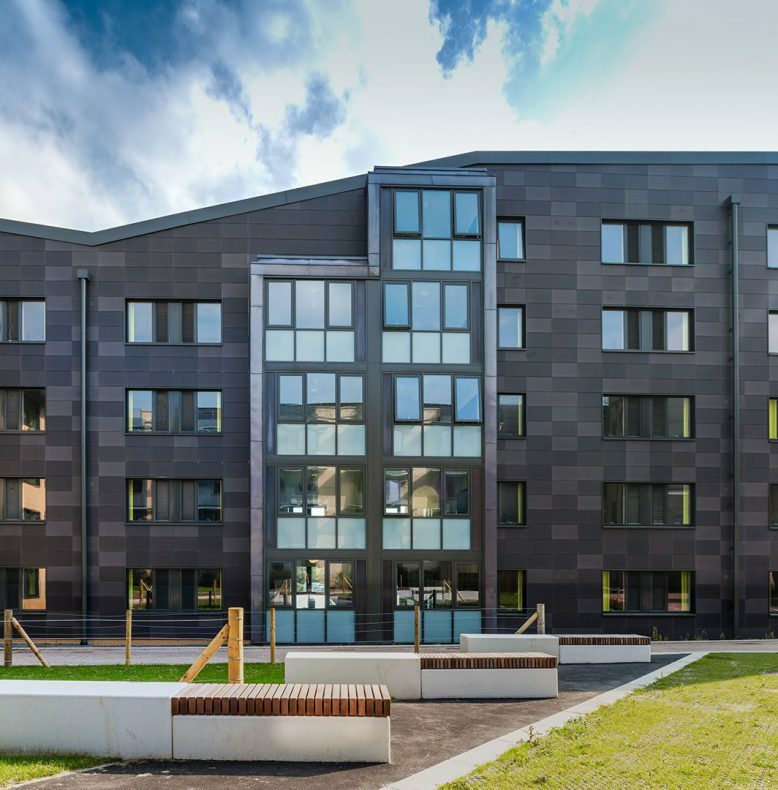 The success of the Quads development has led to a similar design concept of cluster flats and large communal spaces being used for Polden, a post-graduate student accommodation scheme for the university, also designed by Stride Treglown. The project was constructed by Laing O’Rourke and project managed by Jones Lang LaSalle. 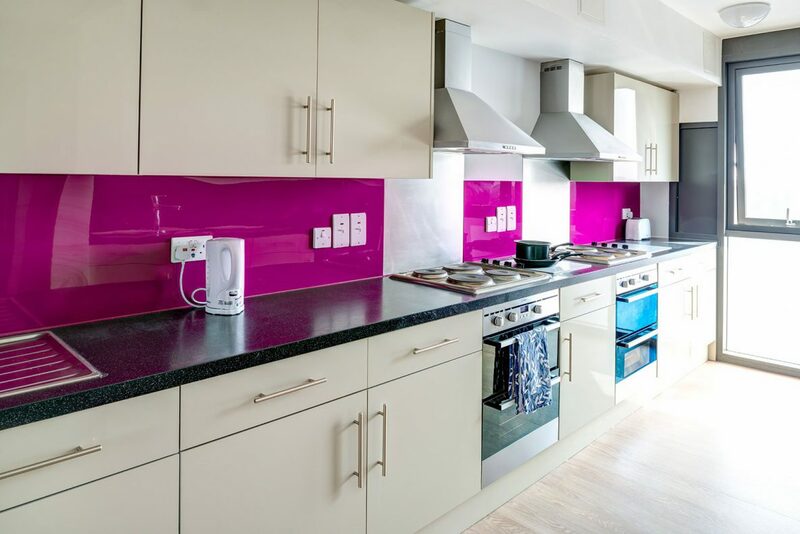 This new development at the University of Bath is located on a prominent site on the University’s hilltop Claverton Campus, outside the City Centre. 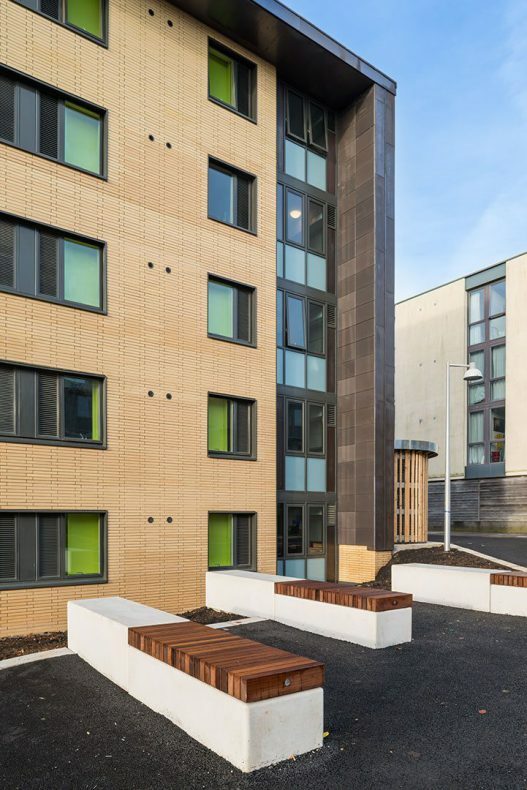 The project comprises two buildings, providing 708 en suite student bedrooms arranged as cluster flats. A spine block with perpendicular spurs creates landscaped courtyards to the north side of the building, created by our landscape architects. We took particular care to ensure that the courtyards have good sight lines for security and visibility while providing a relaxing and informal area in which to sit in good weather. Each has its own distinct landscape flavour. All ground floor bedrooms are protected by a planting margin to provide security. The parapet design of the buildings provides a varied roof profile evident particularly when viewing them from within the courtyards. The spine building is clad in a material that is 95% recycled. Overall the project benefits greatly from the collaboration of our architecture and landscape teams.